The bearer was a British Subject (Citizen of the State of Singapore) but was not a given a full passport. The real reason is unknown and can only be assumed that new passport booklet was not yet ready as Singapore has just attained it self-government towards the late of 1959. The cost for the certificate was also similar to a full booklet passport: $5. The passport was endorsed for Hong Kong, Malaya and China. The bearer travelled to China in March and returning two months later in May. He took with him M$1,000 on 16 March and when returned to Singapore, returned for an exchange of M$500 on 11 May, a few days after he arrived. 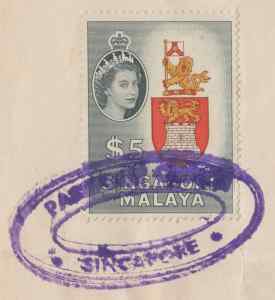 Despite the use of the name of British Malaya, Singapore was actually separated from the peninsular in term of governance and immigration control. The only common things that both shared were the currency (Malayan Dollar / M$) and postal system arrangement.